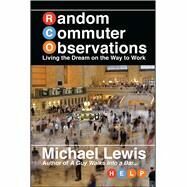 One part biting social commentary, one part sage advice, and all a collection of hilarious absurdities on the “joys” of commuting, Random Commuter Observations (RCOs) will make you cringe in recognition and maybe smile. After all, what other choice do you have? Michael Lewis is the author of ten books, including The 100 Best Beatles Songs and A Guy Walks Into a Bar. A longtime book editor and chronic commuter, he has worked in publishing for more than 25 years. He lives in northern NJ.